US stock markets on Wednesday faced their worst sell-off since February. Traders are paying close attention to key technical levels, and right now the 200-day moving average is in focus. The S&P 500’s 200-day moving average has been tested three times this year, and has so far managed to hold. The Nasdaq has already plunged below the technical level for first time since June 2016. US stock markets witnessed their heaviest selling since February on Wednesday, with all of the major averages tumbling to their lowest levels in three months. Amid the recent selling, the Cboe Volatility Index, which measures market volatility and is commonly referred to as its “fear gauge,” has more than doubled in the past week. It jumped another 6% early Thursday as fears of a major market correction remain at the forefront of investors’ minds. And one place investors are paying close attention to for clues to if this sell-off has further room to go is the 200-day moving average, a key technical level. Simply put, the 200-day is an indicator traders use to determine the overall trend of the market. The market is in an uptrend as long as it’s above its 200-day, and it’s in a downtrend if it’s below the measure. 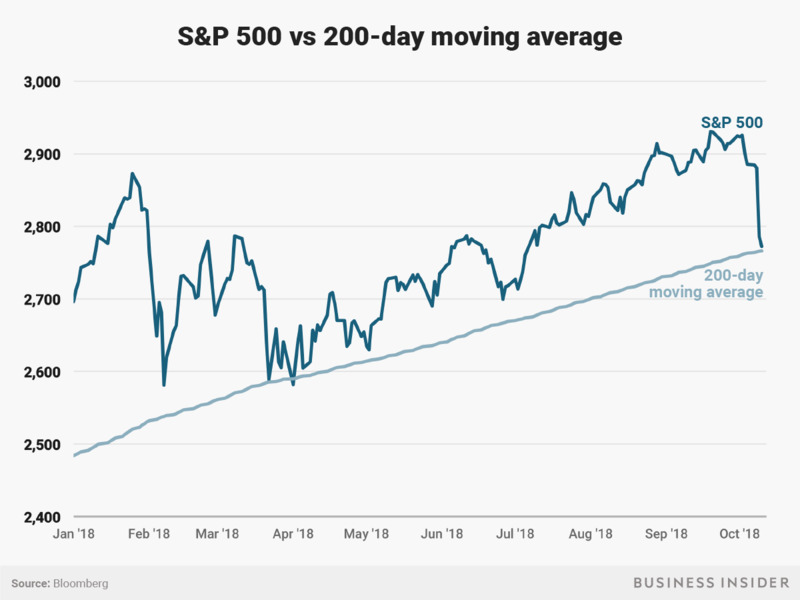 “The S&P 500 is testing the 200 day moving average,” said Hussein Sayed, chief market strategist at FXTM, an online forex trading broker. So what happens if the market falls below the 200-day moving average and stays there? We can look to the last time that happened – from August 2015 to February 2016 – for some clues. In August 2015, the US stock market suffered a shock amid the fallout from Greece’s default on an IMF loan payment and China’s “Black Monday”, the day the country’s benchmark Shanghai Composite index fell more than 8%. The S&P 500 quickly tumbled into a correction, down more than 10% from its recent high, after sliding below its 200-day moving average. Shares would make back nearly all of their losses before taking out those lows a few months later. The drop extended to a total of more than 15% by February. The benchmark index wouldn’t make a new high until June, just after the UK’s Brexit vote. Before that, the previous time the S&P 500 spent an extended period of time below its 200-day was during the summer of 2011, when it plunged into a brief bear market following the US losing its “AAA” rating at the ratings agency Standard & Poors. It wouldn’t make new highs until February 2012. He better start paying attention.